This book is in its third publication. 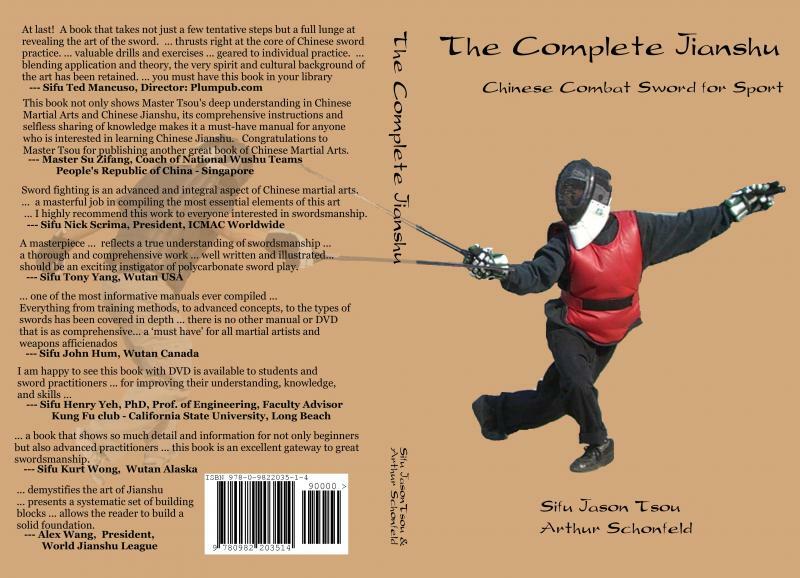 In the book, Jason Tsou and his disciple, Art Schonfeld discuss part of Sifu Tsou's methodology for learning and training Yang Style Taiji. Much of Sifu Tsou's back ground in Taiji derives from Yang Ban Hou and Yang Shao Ho, the uncle and older brother of Yang Cheng Fu respectively. 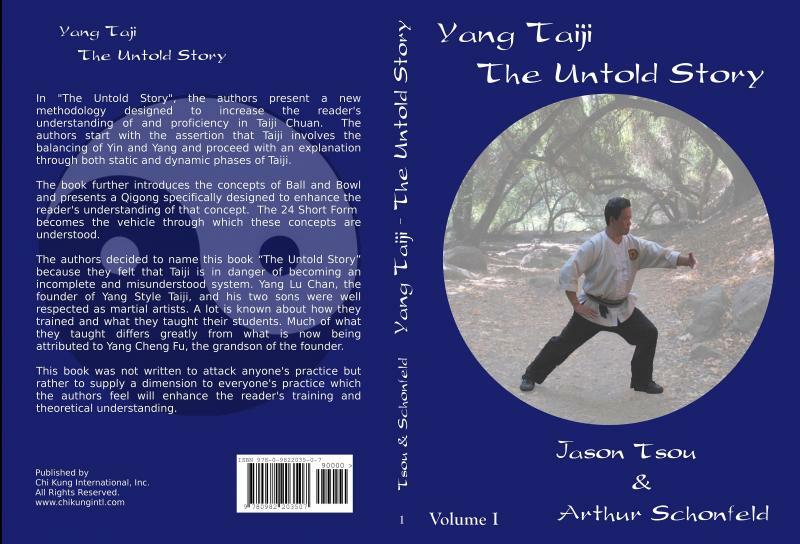 They use the subtitle- "the untold story" because it is their feeling that Yang Cheng Fu either omitted or withheld much of the substance of Yang Style in the forms and teachings that come down to us through his lineage today. In this book they explain that Taiji involves the balancing of yin and yang energy and that as a martial art our objective is to balance the energy of one's opponent in order to neutralize his attack. They focus upon the 24 short form as a starting point for their discussion but stress the importance of learning Long Fist stances as well as understanding the historical influence of long fist, and Chinese metaphysical thinking on the style as it evolved. The book includes a discussion of the metaphysics that includes the use of Taiji as a stage in the cyclical progression of the universe. Yang Style Taiji as taught by Sifu Tsou can be viewed as a progression from ball to bowl. The Qi is formed as a ball and is then compressed, twisted and stretched into a bowl as the practitioner transitions from Ting (listening energy through Hwa (diverting energy) to Na (controlling energy and finally Fa (power issuing). Along with the eight Long Fist stances, a Taiji Qigong, (Ball and Bowl training) is presented as major building blocks for the development of proper body structure and Taiji flavor. 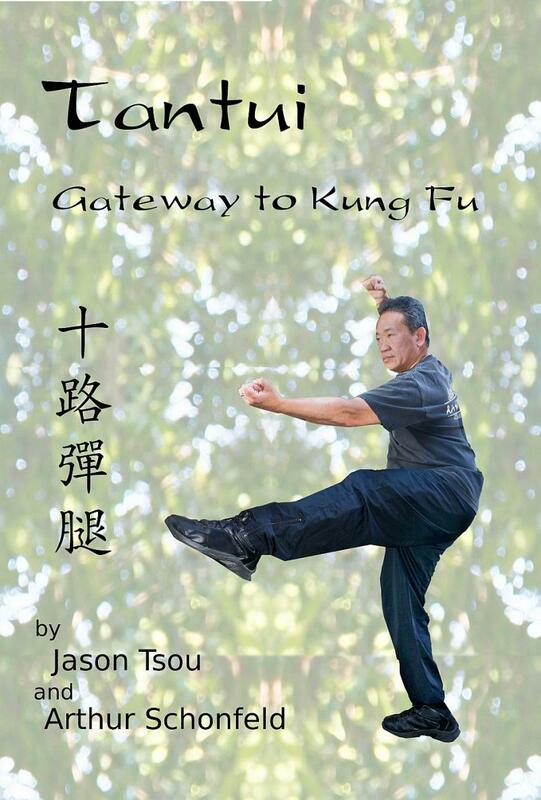 The book also includes a detailed set of photographs in which Sifu Tsou details both postures and transitions as he demonstrates the 24 short form. We have further plans to publish two more volumes dealing with Yang Style Taiji as well as a project dealing with Chen Style Taiji. Many people make the erroneous assumption that Chin na confines itself to locks and holds. 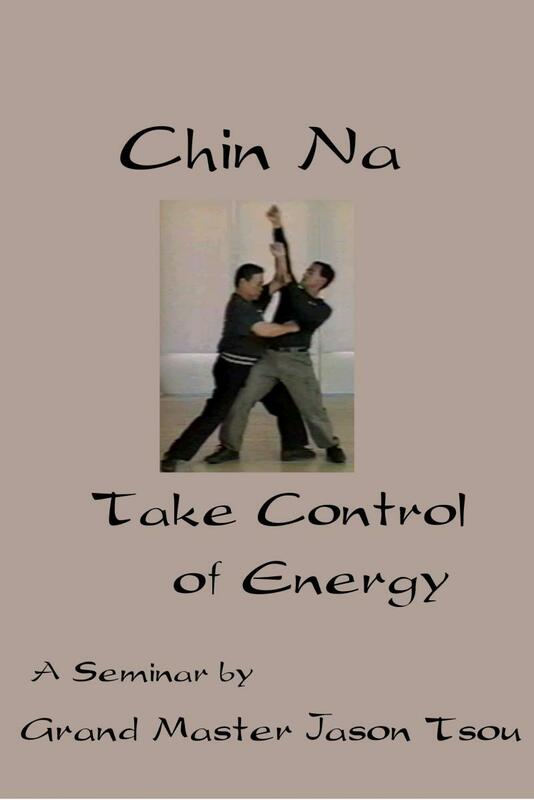 While this is a by product of an understanding of Chin-na, Sifu Tsou explains in this seminar setting that Chin-na is actually a method whereby a skilled practitoner can control energy.The energy controlled is not just limited to one's opponent's energy,it includes not only the opponent's energy, but the practitoner's energy and the energy that exists within the ambient environment. Understood in this way, Chin-na is not a practice exclusive to serious fighting. It becomes a way of understanding movement. In other words, Chin-na techniques can be found in virtually every movement of every martial arts form if you know how to look for them. The awareness of these techniques will add depth to your understanding and allow you to safely employ the principles during competitive sparring. Therefore, anyone interested in martial arts can deepen their understanding from use of the principles employed in this book. Sifu Tsou has structured the information in such a way as to make it useful for all practitioners of martial arts regardless of their present level. The five major techniques of Chin-na, Jie Mai,(interrupting qi flow in the extremities) Bi Qi (interrupting Qi flow in the torso),Fen Jing,( separating tendons) Cuo Gu (destroying skeletal structure) and Dim Mak (pressure points along the meridian lines) are all discussed and examined in terms of the underlying principle of controlling energy. Instead of memorizing a number of detailed techniques, Sifu Tsou explains to his students how to recognize and utilize certain principles. With this new ability, the student will recognize otherwise unseen opportunities as they present themselves during a sparring session. At the same time, understanding of the interplay of these same principles will deepen the student's understanding and add further dimension to their performance of whatever forms they are currently practicing. This book can come with a spiral binding or unbound at the buyer's request. 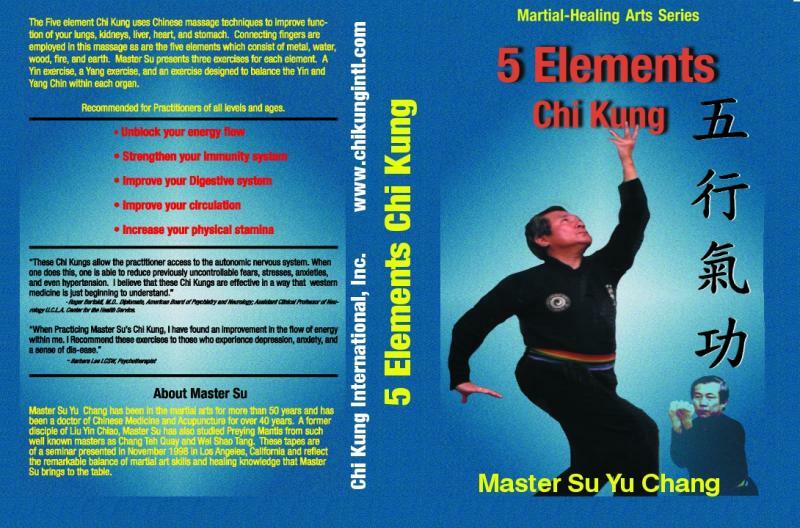 This Chi Kung (Qigong) has three levels, Tjhe first level is designed to teach the student how to take energy in the form of Five Element Qi from the environment. The five elements, Metal, Water, Wood, Fire and Earth, connect with our internal organs as well as external body parts. The second level teaches us how to send this energy (now stored in various parts of our body) back into the environment while the third level teaches us how to interchange with the environment (almost like inhaling oxygen and emitting carbon dioxide) as we walk. Both the second and third level add animals to the process. Finally the Qigong morphs into a form known as the "Eight Mother Palms". The set includes two DVDs. 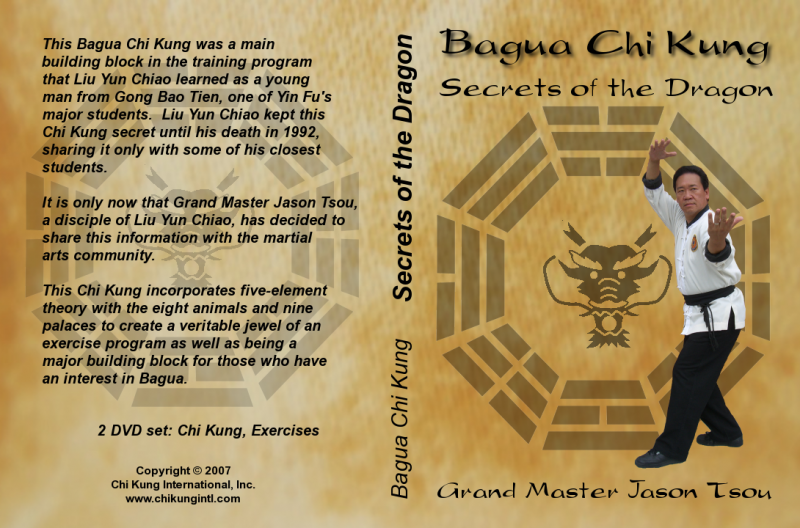 The first DVD is instructional while the second DVD allows the viewer to practice with Sifu Tsou as he demonstrates the Chi Kung in its entirety without interruption. The phrase, "four ounces of energy will move a thousand pounds of force" is first attributed to Wang Zong Yue. 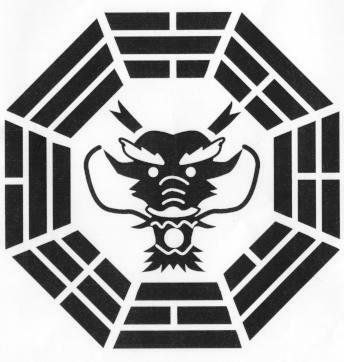 Yang Ban Hou, the son of Yang Lu Chan expanded upon this in his poem where he says" Trap your opponent within the Random Circle and four ounces of energy will move a thousand pounds of force." 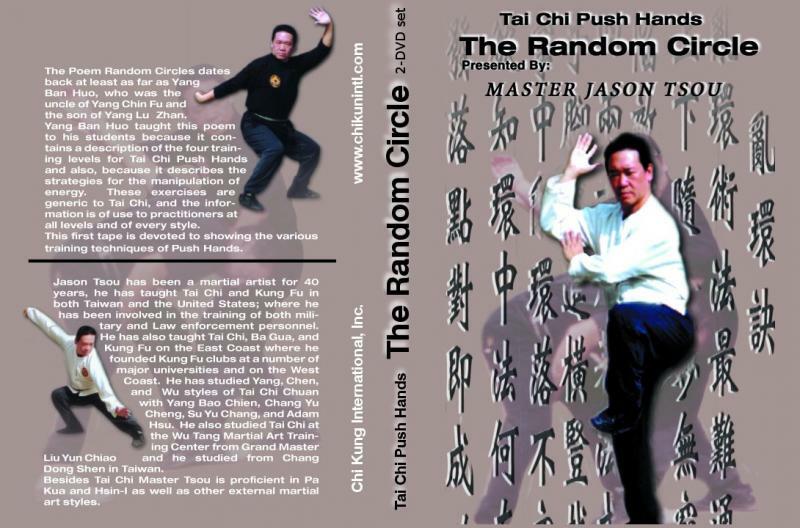 In this DVD, Sifu Jason Tsou explores all of the possible arm movements of Tai Chi, shows each of them as a Random Circle and demonstrates what can best be described as an expanded version of Tai Chi Push Hands. Yang Ban Hou's poem is discussed in detail as are practical applications of many of the best known Tai Chi movements both in the Yang Style and the original Chen Style. The set consists of two disks. The first disk contains a listing and description of the various Random Circle expercises while the sercond disk is dedicated to showing and explaining the applications of various movements while at the same time using Yang Ban Hou's poem as the point of reference. 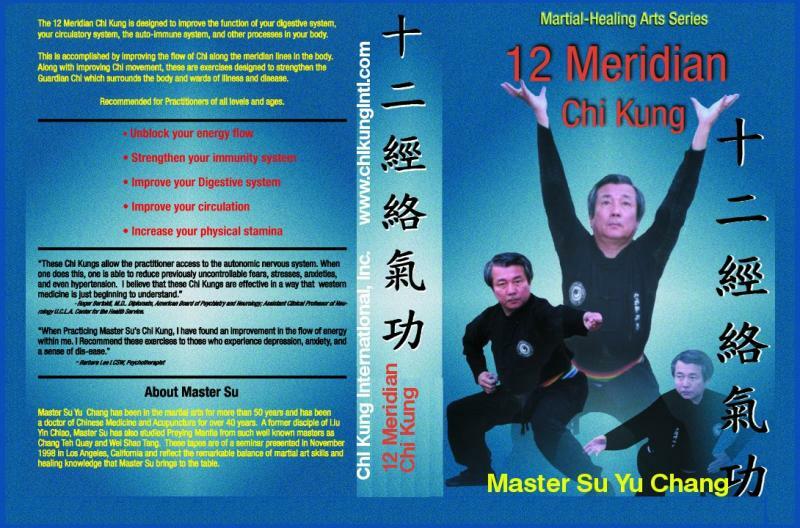 This tape can be the companion to the Yang Taiji the untold story- since it presents a visual depiction of both the Chi- Kung and the 24 form presented in that book. 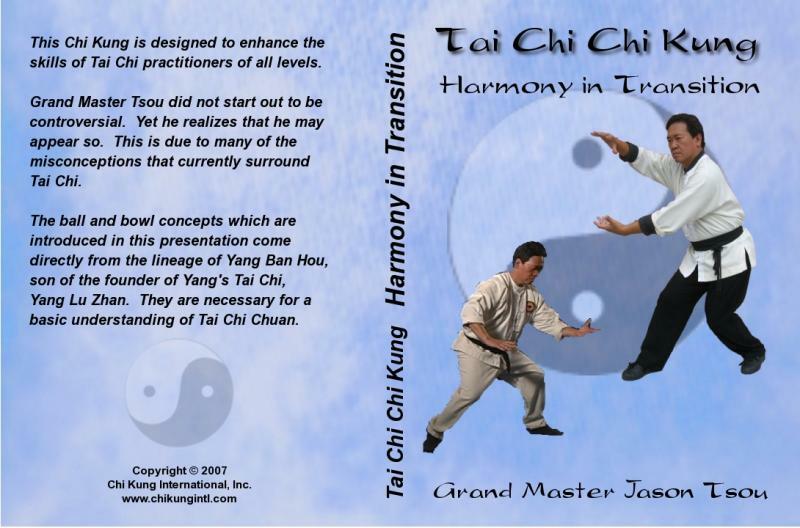 But the idea of seeing movements in Tai Chi (Taiji) as transitioning from the closed system of a ball (Ting energy and Hwa energy to Na energy) to the open system of a Bowl (Na energy to Fa energy) applies to all Taiji Quan. This set contains two disks. 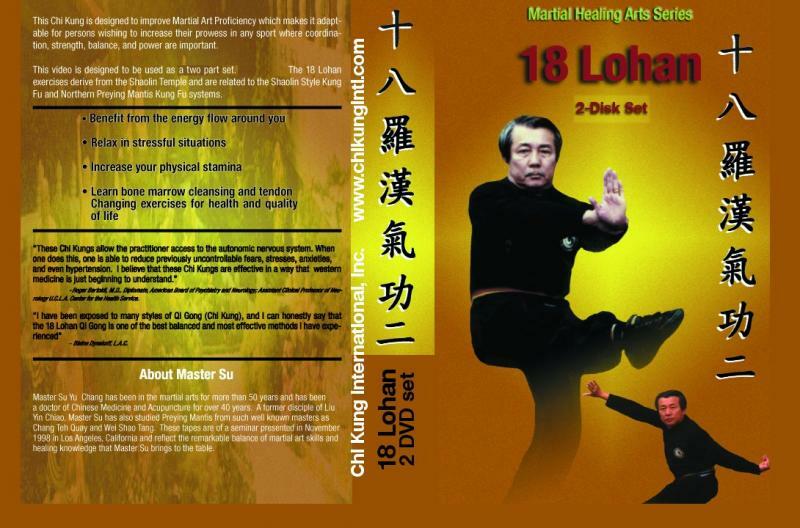 The first devoted to the teaching of the Chi Kung within the context of the 24 form and the second, shorter disk which involves Sifu Tsou leading the viewer through the entire set of exercises.